Modern’s current aggro decks are led by two governing forces: Hollow One and Vengevine. While sometimes played in the same deck, these cards each helm their own archetypes, and continue the big-creatures-quick tradition established at Pro Tour Oath of the Gatewatch by Thought-Knot Seer and Reality Smasher. At Pro Tour 25th Anniversary, Hollow One and Bridgevine established their own contemporary dominance. The decks lack the punch of eight Eldrazi Temples, but are nonetheless built in a way that maximizes the reliability of their respective namesakes, each attacking from enough angles to weather the hate. Their existence and success is reshaping the Modern landscape, affecting everything from playable hate cards to respectable clocks. This article compares the Hollow One and Bridgevine decks and examines the effects each has had on the Modern metagame. Hollow One and Bridgevine abuse disparate engines in uncannily similar ways. Their shared gameplan is to quickly create a battlefield opponents cannot overcome. Go-wide creatures (Flamewake Phoenix; Goblin Bushwhacker) invalidate one-for-one removal; go-tall ones (Hollow One; Vengevine) blank the most popular targeting kill spells. Recursive threats and value engines (Bloodghast; Bridge from Below) counter sweeper effects. Spinning the gears in both cases is Faithless Looting, enabler extraordinaire and all-around fantastic cantrip in a format that rewards players for ignoring card advantage. After reviewing some sample decklists from the Pro Tour, we’ll contrast how each deck operates at different stages in the game. In the early-game, both decks can go for their Plan A of dumping many creatures into play. Sometimes, more setup is required. Bridgevine takes this setup step more literally, as its one-drops attest to: Stitcher’s Supplier and Insolent Neonate are both Dark Rituals of sorts that ramp the deck into above-curve plays. With a Bridge from Below in the graveyard, Walking Ballista and Hangerback Walker can be slammed for 0 and immediately die, creating Zombie tokens while triggering Vengevine. Looting fixes sketchy openers and Greater Gardadon threatens to upend a board state later. In this phase, Hollow One is built to make bigger plays more reliably. It’s got a Delver of Secrets in Flameblade Adept, which swings for a whopping four damage so long as Hollow One does what it was going to do anyway, and of course boasts the theoretical ceiling of dropping a playset of Hollow Ones into play as early as the first turn. Burning Inquiry therefore provides mana that can be “spent” right away, all while possibly disrupting opponents with lucky discards. Since opponents kept whatever hand, a turn one Burning frequently messes with their gameplan to some degree, and occasionally provides a huge swing. Modern’s new aggro kings are revered for their explosive early starts, but secretly prefer the mid-game. To be clear, the mid-game for these decks exists from anywhere between turns two and four. Hollow One: With its early creatures dealt with, Hollow One enters the phase of recurring Flamewake Phoenix and soaring over the battlefield. This plan decimates aggro-control decks looking to gain an upper hand in the damage race, and Bloodghast adds insult to injury against attrition opponents that don’t block, such as Jeskai Control. Flashed-back Lootings end up paying for themselves by rushing out more Hollow Ones and Gurmags, which in turn trigger Phoenix. Bridgevine: This deck has hopefully accrued a respectable battlefield of 1/1s, 2/1s, and 2/2s at this point, and is looking to turn those bodies into victories. That’s where Goblin Bushwhacker and Greater Gargadon come in. The former generates a huge damage swing as early as turn two, while the latter squeezes value out of removal-targeted creatures, protects graveyard-based threats from exiling removal, and grows Zombie tokens with Bridge from Below. Given multiple binned Bridges, Gargadon can double the size of an assault. The beast also comes off suspend itself towards the end of this phase, forcing opponents to deal with a huge body while counting as a cast creature for Vengevine. While neither deck strives to reach the late-game, such scenarios do occur. Hollow One hard-casts its threats at this point, and save for the odd Bloodghast or Phoenix, plays off the top of its deck. Not true of Bridgevine, which tends to have more going on at this phase. Greater Gargadon might be on suspend; Bridge from Below makes it difficult for opponents to swing in with a big beater; Vengevine is like Ghast and Phoenix in one, if it can trigger. This deck too can hardcast its threats, only what Bridgevine can muster is much scarier than a 4/4: a loaded up Hangarback Walker, perhaps, or a lethal-reach Walking Ballista. While Bridgevine wins the above concours two-to-one, it’s not the de-facto best deck. Bridgevine works hard for its mid- and late-game synergies, and pays for them after sideboarding; graveyard hate is far more effective against this strategy than against Hollow One. Both decks resist hosers to some degree: Hollow One doesn’t need the graveyard to close out games with Adept and its 4/4, or even a hard-cast Phoenix. Bridgevine’s plan is to get under Rest in Peace, the elephant in the room, by setting up a board intimidating enough to punish opponents from tapping out for an enchantment. Such a setup isn’t always possible, though. Anger of the Gods is a doozy against Bridgevine even with Gargadon suspended—sure, its creatures aren’t gone for good, but even the 2/2s Bridge makes in the process are exiled, making Bridgevine unlikely to have pressure left over. The deck is worse than Dredge at rebuilding after such a sweep, as it burns through in-hand resources quickly to set up an initial board. Bridgevine, for better and for worse, is more synergy-focused than Hollow One, which exists more on the goodstuff side of the spectrum. Its gameplan is therefore more streamlined, but less robust in the face of heavy-duty disruption. Prior to Hollow One and Bridgevine breaking out, another deck existed in Modern that operated in a similar manner: my own Colorless Eldrazi Stompy. Colorless uses Serum Powder to constantly open hands with Eldrazi Temple, a card that allows us to spend far more mana than opponents on already pushed creatures. In addition to disruptive beaters (Thought-Knot Seer), hasty closers (Reality Smasher), and a Delver-style early clock (Eldrazi Mimic), the deck also runs a compact value package that blanks all enemy removal: Eternal Scourge plus Relic of Progenitus. So where does Colorless fit in now? I’d rate the deck as relatively proactive, relatively interactive, and highly consistent. By comparison, Hollow One and Bridgevine are both highly proactive, minimally interactive, and relatively consistent. In other words, Colorless is a slower, more disruptive version of these decks; think Mardu Pyromancer over something like Jund. Colorless Eldrazi Stompy’s disruption suite is anchored by Chalice of the Void, which we have a better time casting on turn one than anyone else in Modern. There’s one small caveat to my claim about consistency. Colorless has an easier time coming out of the gate, or setting up an early game that plays to its strengths. While Hollow One and Bridgevine are likelier to stumble in the first few turns, they’re also likelier to have seen more of their deck in the mid-game, and to enjoy access to the majority of their packages. They’re both more consistent later on, except when facing down graveyard hosers. I still think this deck has a place in the metagame, but I no longer believe it’s the straight-up best thing to be doing in Modern. Other strategies have moved in to claim a slice of our niche, and in some regards beat us at our own game. The rise of Hollow One and Bridgevine has had a couple subtle effects on the metagame. Unwieldy hate cards are becoming less popular, especially Blood Moon. And no wonder: Hollow One and Bridgevine both plan to kill before those hosers can come online or at least make much of a difference. Aggro decks used to run Blood Moon in their sideboards to get under the big mana decks, but today’s aggro decks are less fair than ever. Hollow One and Bridgevine both occupy the aggro-combo shard of the archetype. These faster aggressive decks don’t need Blood Moon to get under Tron; they can just end the game more quickly instead. The recursive combo element in these decks also gives them game against midrange. Part of what made Blood Moon so appealing in the past was its applications against aggro-control, which frequently dipped into three colors (i.e. Jund, Jeskai). But Flamewake Phoenix and Bridge from Below give Modern’s aggro newcomers plenty of existing tools in those matchups, too. Replacing the clunky hate in sideboards is… well, Damping Sphere. At just two mana, Sphere is cheaper than Moon, and also attacks Modern’s premier non-Tron combo decks: Storm and Ironworks, neither of which particularly cares about enemy Moons. That’s significant coverage for such a splashable card. 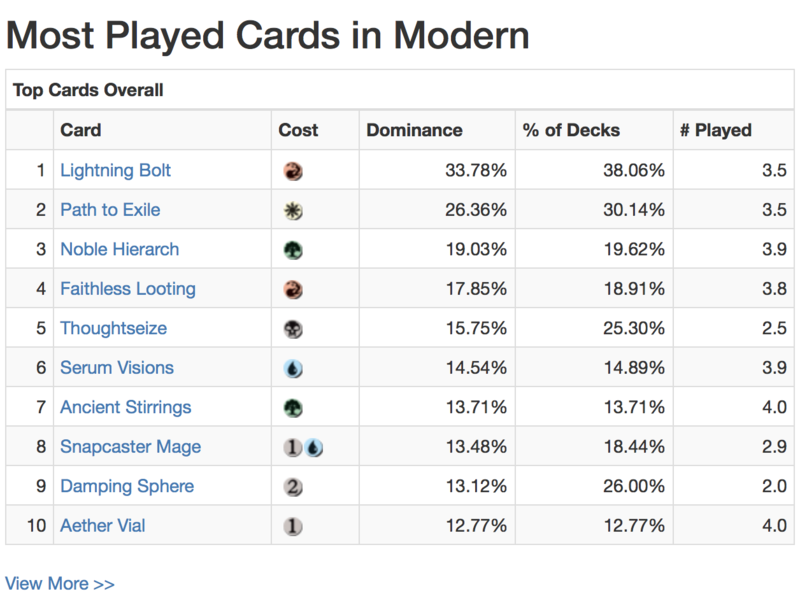 At the time of writing, Damping Sphere makes the format’s Top 10 list of most-played cards according to tournament aggregate MTGGoldfish. I expect this trend to continue and evolve to beat Hollow One and Bridgevine. Both decks already pack a set of Leyline of the Void, a fine card in the mirror with very low opportunity cost—pilots can simply discard dead copies (it also prevents opponents from exiling Bridge naturally). While non-Looting decks may not have that luxury, I’d expect Nihil Spellbomb to sustain prominence in black midrange decks, and perhaps for Tormod’s Crypt to surface elsewhere. 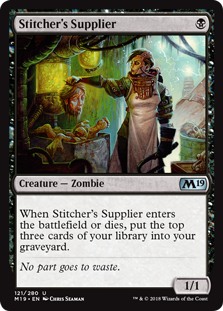 The sideboard card I think stands to gain the most from Modern’s new paradigm shift is Surgical Extraction. While it doesn’t shut down the entire graveyard, Surgical takes care of whatever graveyard synergy is happening in the moment, removing all copies of Flamewake Phoenix, Vengevine, or Bridge from Below before they can wreak any sort of havoc. The card also boasts applications against Modern’s pure combo decks. Best of all, it costs no mana, meaning virtually any deck can splash it. Scoot over, Wild Nacatl—one mana for a 3/3 just ain’t that impressive a rate anymore. Modern players the world over are getting 4/4s for zero! Goodstuff combat creatures in general seem to have taken a major hit, chief among them the chief among them, Tarmogoyf. Playing Goyf had already been complicated by Fatal Push when Hollow One and Bridgevine rolled around, but now the creature’s got bigger issues, literally. Not that Hollow One and Bridgevine are the only playable aggro decks; far from it. Rather, the remaining aggro decks are just less concerned with raw efficiency relative to synergy, leaving them open to narrower means of disruption (i.e. damage-based sweepers). This trend extends from ostensibly fair tribal decks like Spirits and Humans to the combo end of things, shared with Hollow and Bridge by Affinity and Infect. Hollow One and Bridgevine are sure to be extremely popular in the coming weeks, and then die down as the metagame adapts. Such is always the case with breakout decks in Modern. But once the metagame’s adapted, Modern will look different than it did before, now informed by the fresh faces of aggro-combo. How do you think the format will shake out? Let me know in the comments. I’m not sure that’s true. It’s common for Modern players to throw their hands into the air every Pro Tour (or new deck) and call for bannings, but we’ve seen that those calls are rarely justified based on Wizards’ criteria. Powerful though they may be, there are plenty of ways to attack these new aggro decks. No matter what you play, you can throw some Surgicals into your sideboard and see where that gets you. Bridgevine is also inconsistent enough that hitting them with targeted discard T1 and chasing that with a clock can end the game fast. The same can be done to Hollow One, but that deck attacks from more angles, so it’s harder to shut down with single-use interaction. That said, it’s slower at actually killing you, which gives other decks time to beat them first. Looting isn’t “broken,” it’s just a great card in a format that doesn’t care so much about card advantage. I’ve championed the card in non-graveyard decks for years. There are lots of sleepers like this in Modern (Death’s Shadow is another example) and for me, part of the format’s appeal is finding these gems first and putting them to good use! 1) would you sleeve up CED stompy for a PPTQ this month? It has a bad MU vs hollow one and a presumably excellent one vs Dredgevine, but it seems much worse against mono sweeper blue white than the old Jeskai that lost to a single Scourge. 2) on the draw vs dredgevine, do you put chalice on 0, chalice on 1, or cut chalice? 1 kills their engine but not if it’s already online, 0 stops all their most explosive plays. 3) which of the two, hollow or vine, has more stating power as a top deck ? I would, with double Surgical side. I think the H1 MU is close, not bad. UW is still favored in my experience. Chalice 0 right away because it’s free so we can spend our mana on other stuff. The next Chalice goes to 1. Same as Affinity. Hollow is more robust, but both decks are here to stay. You cut a gutshot or a Bomb for the surgical? I Took the deck to top 4 of a PPTQ today (11-3 record in games! ), only to get issued a loss as my chalice was found on the floor under my last match table, and I didn’t count my deck. Was heavily favoured to make the finals 🙁 beats etc. (Not sure if I would have preferred the win or the 120 dollar card). I beat hollow one three times, so yeah it felt close not unfavourable. I wouldn’t say chalice on 0 stops Bridgevine. It just slows them down negating bridge tokens, since vengevine has a cast trigger. That said may be the correct move anyway.